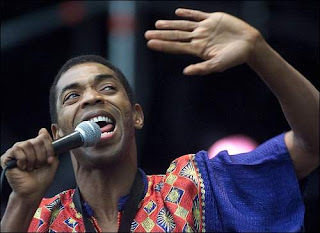 Afrobeat singer Femi Kuti has been nominated at the 54th edition of the prestigious Grammy Awards. Femi picked up his third ever nomination in the World Music Category for his ‘Africa for Africa‘ album last night Wednesday, November 30, 2011 when the list was unveiled at the ‘Grammy Nominations Concert Live! !‘ in Los Angeles, US. In 2003, Femi, eldest son of late Afrobeat pioneer Fela Anikulapo Kuti picked up his first ever Grammy Award nomination but lost out to Panamanian salsa singer Rubén Blades. He similarly lost in 2010 when he was nominated in the same category. US banjo player Bela Fleck walked away with the award. His recent nomination sees him up against Latin/Roots music band AfroCubism, South African male choral group Ladysmith Black Mambazo, and Malian band Tinariwen. The awards ceremony is billed to hold on February 12, 2012, at the Staples Center in Los Angeles. congratulations femi. Hope you win this time.